Because your business is worried that it might not get enough traffic on its own, hire a PR/social media firm to send out emails like the one below baiting bloggers into giving an otherwise undeserving piece written for shock’s sake (you remember what I said about shock as art) some attention. 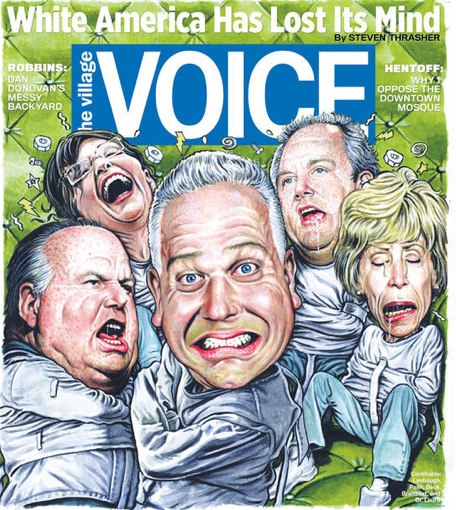 Wanted to pass along this week’s Village Voice cover story from Steven Thrasher – it’s an interesting take on the decay of the white brain and attempt to determine if it can be cured. Although, you cannot help but chuckle at the “Sources of White Stress” diagram in the piece, which supplements the various examples of white baby boomers behaving “insane.” Thrasher attributes this to the “stingy” reaction from these boomers who fully understand that their tax dollars are going to education, healthcare and welfare for the “coming browns” (40% of our nations population under 18, whites will be a minority by 2023). The URL to the piece follows below – would be interesting to see your reaction. Let me know if you have any questions or would like additional information on this week’s Village Voice. Just imagine for a moment if someone had written “Sources of Black Stress” and portrayed people like Al Sharpton or John Lewis in this manner. I couldn’t even read through the entire article. I’ve read critiques of conservative America before and have even chuckled, as Marissa said, with those, but that’s because the author could write well enough to accurately convey sarcasm without offense. Unfortunately, that’s not what we have here with a publication whose online life must thrive for the print side to make financial sense. I wonder if that’s why dinosaur publications must go to such extreme lengths to attract eyeballs – and they depend upon the blogosphere to push them with reaction. The article is a frosh attempt to characterize the entire conservative movement as being solely Glenn Beck, Rush Limbaugh, and a few other white people. Thrasher insists that it’s an all-white movement. As a former OFA worker, Thrasher is doing his party proud by following the cardinal rule of soc-prog politics: ignore the black conservatives. Deneen Borelli calls this “plantation politics.” Why is the media so terrified acknowledging the existence of black conservatives? Pretty soon, they’ll have people standing in front of the polls … oh, wait. Right. Because saying “chicken” is racist. Does Thrasher think that only black people eat chicken and because of that, immediately assumes this is racist? Because I ADORE chicken. DeLay is from Texas, after all, and in certain parts of the hemisphere, that’s considered a pretty damn good meal, race aside. But because they said “sorry” after they were caught and trashed in the public, that totally absolved them of any racist feelings in their hearts. Repentance? In faith, it’s motivated by wanting to do better as a person, not a formality one must begrudgingly endure so as to bypass a PR disaster. White people, after all, had managed to invent a spiffy new form of self-government so that all white men (and, eventually, women) could have a say in how white people were taxed and governed. White minds had also nearly universally occupied just about every branch of that government and, for more than two centuries, had kept sole possession of the leadership of its executive branch (whose parsonage, after all, is called the White House). White people have simply gone sheer f*cking insane. Thrasher cites Acorn, the group which plead guilty to massive voter fraud in St. Louis. November 2009, Public Policy Polling found that more than a quarter of Americans (and an outright majority of Republican voters) believed that ACORN had stolen the election for Obama. OMGWTF! You mean Americans distrust a group which plead GUILTY to VOTER FRAUD? Nooooo! Perhaps he never read the police report wherein O’Keefe was never picked up for “wiretapping.” For someone to complain about white people and puppets so much, Thrasher does a helluva job in letting the liberal white patriarchy pull the strings of the talking points. Everyone on the same page! Thrasher honestly has no clue what he’s talking about, a very important prerequisite if you’re going to write a blabbering piece airing out your hatred of conservatives and your refusal to acknowledge black conservative America. It’s easier to get a paycheck for writing a diary entry on how badly you hate conservatives when you don’t research the very topics about which you’re writing. Why isn’t he calling the people who are trying to bilk billions of dollars from the public via the fraudulent and corrupted Pigford case (the reason that the White House acted so quickly to toss Sherrod under the bus; the didn’t want the public to find out that she was connected to a massive case of fraud which could implicate the president as it was he, as a senator, who ushered Pigford back to Washington) ratf*ckers? Here’s a challenge for you Thrasher: be worthy of the journalist title which you claim and write a five-page diatribe on that. My interest trailed off when he decided that Mark Williams was the tea party head (which, if that’s the game he’s playing, I’ll go ahead and assume that Jeremiah Wright is the head of all progressives) that, and I was tired of being screeched at by an angry former OFA worker whose knowledge of the issues he tackled was limited to whatever Kos had posted about them. And dinosaur media wonders why America has given them a vote of no confidence. This entry was posted in Democrats, FAIL, Lame, Liberals, Socialists by Dana Loesch. Bookmark the permalink.